Welcome to the world, sweet little one! 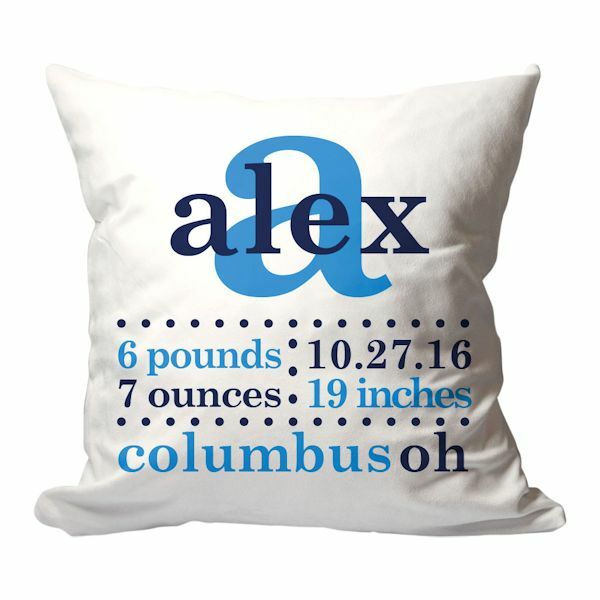 Capture the moment the newest addition came to meet his or her family with this adorable personalized birth announcement pillow. There is room for all of the most important information you won't want to forget, including date, weight and height. Perfect gift for Mom and Dad as they decorate the nursery in style. Specify the following: Initial, first name, weight, height, birthdate, and location. See personalization fields for character limits. Machine washable, suede-like 100% polyester. Generously sized at 18" x 18". Includes insert. Allow 3 weeks. No rush delivery or gift box. Item can only be shipped within the Continental US.